Colorado Peak Politics | BUMPER STICKERS, PLEASE: Gardner for President! BUMPER STICKERS, PLEASE: Gardner for President! 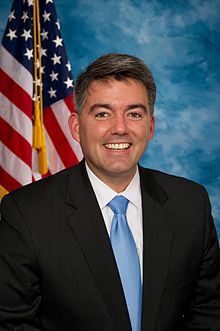 Here’s a whisper campaign we can support: Cory Gardner for president! The nation hasn’t even settled on a Republican or Democratic candidate for 2016, and already Gardner is being lauded as a candidate in 2020. The American Spectator predicts that if Hillary Clinton wins the 2016 campaign, Gardner is one of two dynamic senators poised to challenge her reelection bid. As a two-term House member Gardner, 40, deflected the charges with poise, and scored a surprisingly large 7-point victory over the incumbent. The win was more like two points, but the Spectator’s enthusiasm is appreciated. And just the fact that Gardner was the Republican nominee at all reflects his political acumen. Tapped by House Republican leaders as a rising star, Gardner was initially reluctant to risk his seat for a Senate race in a state that had, until 2014, been trending Democratic. And he’s a serious policy guy, too. Gardner “has become one of the House’s most active players on energy issues,” writes the 2014 Almanac of American Politics. This must really be nauseating for U.S. Sen. Michael Bennet, watching the D.C. media predict his demise, while promoting Gardner’s rise.